While in Playa del Carmen, don’t miss this opportunity to visit one of the world’s oldest subterranean river systems. Make your way around limestone rock and explore cenotes and underground rivers. Then, snorkel in Yal Ku lagoon, a mixture of seawater and freshwater. Back on land, stroll along the landscaped grounds surrounding the lagoon. This 3.5-hour morning tour includes hotel transport from select Riviera Maya locations. Discover subterranean landscapes that are part of the world’s third-longest underground river system on this 3.5-hour tour from Playa del Carmen. Enjoy an exhilarating swim as you explore a cenote, an underground pool of crystal-clear water. 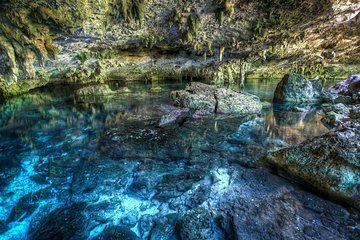 On the Yucatan Peninsula, rainwater seeps through porous limestone rock into cenotes and underground rivers in search of an outlet to the sea. As each drop falls into caverns, stunning rock formations are created. Continue to Yal Ku, a lagoon where the warm waters from the sea combine with fresh water from underground rivers, creating a special snorkeling environment. Caves and valleys are part of your underwater scenery. Located in a protected cove, the lagoon is a great place for beginning snorkelers and the more experienced alike. When you’re done with snorkeling, walk about the manicured pathways surrounding the lagoon. Your tour includes hotel pickup and drop-off from select locations.